Triple R Diesel is a truck dealer that specializes in custom building semi trucks. Our main concern is customer satisfaction. We convert USED tractors into dump trucks. In the past 8 years Triple R Diesel has built well over 800 dump trucks that have been delivered from Hawaii to New York. 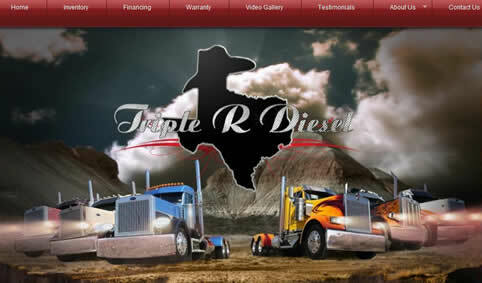 Triple R Diesel is launching their renovated 2009 website. The new website offers customers the ability to search their inventory, browse through semi truck upgrades, and watch videos from the video gallery. The flash introduction is definitely worth looking at. The videos Triple R Diesel posts every week are a great feature to keep clients interested in coming back! In the year 2001, Mr. Mendez and his family built a service shop called Triple R Diesel where the Mendez philosophy can be extended now to all fellow truck drivers. Triple R Diesel is a truck dealer that specializes in custom building dump trucks. Our main concern is customer satisfaction. At Triple R Diesel, truck drivers can buy a semi truck without having to worry about any future problems. They won’t loose their business if any major failure occurs; especially if they invested all their money putting their truck into operation. Everyone is entitled to respect, honesty prices, the best work, and have a company with integrity service their tractors. The last several years have shown that the same principals that made Mendez Trucking one of the greatest companies in Texas can also be applied with great success to their service center and parts shop Triple R Diesel.